This is my eleventh year without a father on Father’s Day. I remember all the life in Wallace Ray Hardy, my father, all the sacrifices, the dedication to family, work, and church, the happy and fun times, the laughter, and it’s so hard to get used to the idea that someone so alive and strong can be gone. It was the same for his father, my grandfather, Thomas Tyre Hardy. He was here, he was a big figure in my life, and then he was gone. It’s like the pillars of life crumble and fall when the old men go. Now, there is no Hardy patriarch, no one to hold up the family and see to it that we’re all okay. My family has no wise old-man leadership, and we need it sometimes. Now, I talk in tears to thin air when I try to talk to my dad and ask for guidance, or I may see dragonflies or butterflies that come back to tell me things. You may think I’m crazy, but it has happened, and I have now learned that if a dragonfly or butterfly comes and lingers a little too long, in the following day or two, all hell is going to break loose and I better prepare myself to stand firm. Sometimes, that’s all you get. A warning from a bug. And Father’s Day is just another day, and I will mow my yard, and I will look at the red roses against the fence because I used to wear one every Father’s Day to Sunday School when I had a father, and I will cry and go on, and then it will be Monday, and everything will be normal again. The men in my father and grandfather’s generations did not show emotion very often. They didn’t hug much, they didn’t express love openly, they just worked and did what they were supposed to do to take care of their family. We knew they loved us because they were always there, at the dinner table, in bed by eight or nine, and they were stable, they could be counted on, they did right by God. But I remember one time when my grandfather shot all this to bits and intensely and openly expressed emotion. It was on a summer Sunday when I was about fourteen. When Sunday rolled around, my grandpa asked who wanted to go to church with him. Like the others in his line, he was a deacon at West Kemper Baptist. His Hardy great-great grandmother and great grandfather were founding members of this church in 1850, and his Abercrombie ancestors were also charter members. They, and all the family, were buried in the cemetery beside the church. Nobody wanted to go to church, but me. My church at home was a big part of my life, and so I’d packed my Sunday dress and high heels. I went to church with my grandfather. He introduced me to everyone: “This is my grand-young’un, Wallace Ray’s daughter, from over in the Delta.” We sat on a pew together, shared a hymnal, listened to the sermon, then drove home over the dirt road in his old Studebaker. He wore a white shirt, tan slacks, and a straw hat to church. He was a tall man and filled up the front seat to the top of the car. With an earnest look on his farm-tanned face, the words came strongly and sincerely: “I have never in my life been so proud than to have one of my grand-young’uns want to go to church with me and to show her around and have her sit there with me. It means a lot to me, and I have never been so proud.” He kept repeating himself to the point that I was somewhat uncomfortable because men didn’t show emotion and he was. But years upon years later, I remember that moment and those words, and it means a lot to me, too. And I am thankful for a good and faithful grandfather and father and glad to have a day set aside amidst all the other days of the year to remember these special men who stand under me. He was one of a kind. Through all the years, I have sifted the memories down to a few that make me smile. Like the night—a school night!—when I went out in the back yard to look for UFOs. This was a big thing back in the 1960s. On weekend nights my friends and I occasionally drove out in the country on dark roads and scanned the sky looking for small moving objects, so hoping for an encounter. One night there were ten or eleven of us in someone’s Volkswagen. All I remember was that I was in the front with one arm over the seat, holding hands with a boy in the back. There were body limbs awry in that car. People were pushed up against and on top of my arm, and the blood circulation to my hand was cut off, but I wasn’t going to let go. We couldn’t see the sky for the body parts, but we had fun. That night in my back yard I kept watching a tiny lighted object moving north to south at a very slow speed. I ran in and told Dad, who followed me willingly out and viewed with me. After a while he said, “I think you’re right. We better go check this out. Let’s get away from the town lights.” I asked him if we could pick up my friend Gerri, and he said to tell her to bring binoculars. So there we were, nine o’clock dark on a country road between Boyle and Skene with cotton fields pressing up to the narrow strip of asphalt, parked on a turnrow, looking up at a starlit sky, convinced we were seeing a UFO and beings from another planet. Next month I’m going to a famous, secret UFO place. I will ride on the Extraterrestrial Highway to the town of Rachel, Nevada. Remember the movie Independence Day? A trailer park scene in the movie was filmed here. I will order an Alien Burger at the diner A’Le’Inn. I will explore Groom Lake Road for thirteen miles before I get to the border of Area 51. There are road sensors buried in the ground to give Area 51 security an early warning of approaching vehicles. There are security cameras and Cammo Dudes who sit at the top of the hill, and if anyone tries to enter Area 51, the Dudes will pull them out of their car and slam them face down on the ground and hold them at gunpoint while they call the Lincoln County Sheriff. I play by the rules so I will not go too close, and I plan to hightail it out of there before the Cammo Men can rough me up. 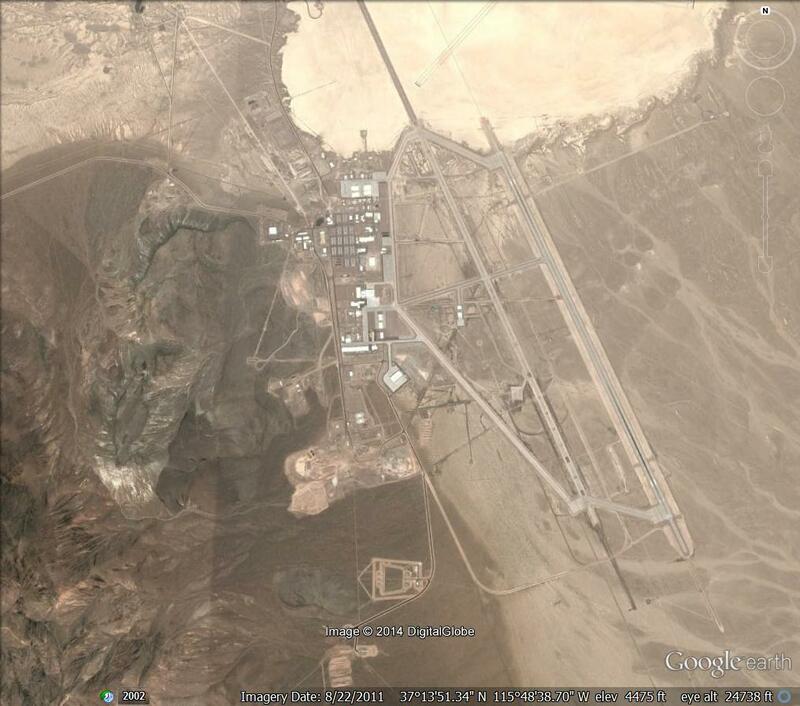 Area 51 is a top-secret military test and development facility, owned and operated by the US Air Force. It is located within the Nevada Test and Training Range (NTTR), 85 miles north of Las Vegas. It is operated as Detachment 3 of the Air Force Flight Test Center, headquartered at Edwards Air Force Base in California. In 1989 according to the Lincoln County Chamber of Commerce, a resident claimed that he had worked with alien spacecraft at Papoose Lake about 35 miles south of Rachel—the location of Area 51. He claimed he saw nine flying saucers in a hangar built into a hillside. Since then, UFO enthusiasts have flocked to the area to look for UFOs. LAS VEGAS (AP) August 16, 2013 — UFO buffs and believers in alien encounters are celebrating the CIA’s clearest acknowledgement yet of the existence of Area 51, the top-secret Cold War test site that has been the subject of elaborate conspiracy theories for decades. The recently declassified documents have set the tinfoil-hat crowd abuzz, though there’s no mention in the papers of UFO crashes, black-eyed extraterrestrials or staged moon landings. The CIA history released [August 16] not only refers to Area 51 by name and describes some of the aviation activities that took place there, but locates the Air Force base on a map, along the dry Groom Lake bed. [Some] are taking the document as a sign of loosening secrecy about the government’s activities in the Nevada desert. The site is known as Area 51 among UFO aficionados because that was the base’s designation on old Nevada test site maps. The CIA history reveals that officials renamed it “Paradise Ranch” to try to lure skilled workers, who can still be seen over Las Vegas flying to and from the site on unmarked planes. Even for those who do not believe in UFOs, the mystery surrounding the site — situated about 100 miles northwest of Las Vegas, across miles of desert speckled with Joshua trees and sagebrush — has been a boon. Dad, you are now up in the skies, and you know the truth. You know how big the universe is, and you know what eternity and infinity mean and what role the Earth plays in eternity and infinity. You know if I’m just chasing rabbits in the desert or if there’s really something to all this stuff. Me? Same as back then when I was just a girl with you under a cool Mississippi night sky and watched a tiny light move south and believed with all my heart. I sure wish you were still here and you could go with me to Area 51. Judi’s going. Maybe we’ll take some Delta dirt from our old back yard and leave there where the extraterrestrials fly. Seven years ago, at about this same hour, eight in the morning, I sat on the couch at home at 807 Deering beside a hospice nurse who told me my daddy wouldn’t make it through the day. Then she called the family doctor and told him. “Let it happen,” he said. Dad had end-stage dementia and was a DNR. We’d gathered to be with him, knowing the time was near — my sister, my older son, and of course, my mother was there. I hung Dad’s flag in front of the house. Dad was a veteran and hung that flag on every war holiday. This day, it was for him. He got a Bronze Star with Valor in the big war, but this day, he’d fight his last one. He didn’t want to go. We kept telling him it was okay, he could go in peace. He didn’t want to leave life, he didn’t want to leave my mother. Sixty-one years they were together. My sister got his tape recorder out and put in the tape of “Rise Again,” a powerful song of the Lord’s resurrection on the third day. “I’ll rise again; death can’t keep me in the ground.” Then she went to check on our mother. Mama was outside planting flowers, knees down in the dirt, hands in the dirt, trying to avoid what was imminent inside the house. My son went to take a shower. I was alone with Dad. He was holding on. “Dad,” I said, “You’ve got to do this first. You’ve got to show us how to do it and then come back and get us when it’s our turn.” His younger brother had died a few years back and it greatly bothered Dad, because he thought he should have gone first, because he was older. I knew he wouldn’t want to outlive any of us. I saw the blood stop in the veins in his arms. Then it moved again. I knew what was happening. I ran outside to get my mother and sister and beat on the bathroom door for my son. We all stood there around our husband and father and grandfather as he went. I don’t want to remember that day. I want to remember all the life in him. The fun times, the funny times, the man that he was, the lessons he taught and stood for. 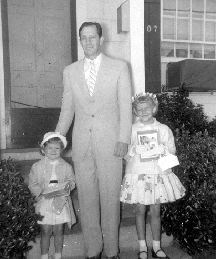 Maybe today, Easter Sunday, a day of life and rising again, I’ll plant a tree for him, a weeping cherry, to remember how blessed and fortunate I am to have had a good father. He wasn’t perfect, but he was good and he gave me something solid to be grounded on, and so today, I remember that man. This was a man who only got firecrackers and oranges for Christmas — maybe an occasional wooden truck — as a boy growing up in backwoods Mississippi in the 1920s and 30s during Depression years. Times were “depressed” all the time for his daddy, a poor dirt farmer with a small plot of 80 acres. He graduated from high school in ’41 and then the war came. He’d gone to Mobile with a cousin to work in a lumber mill, and they decided they’d work a little longer, earn some money, and then join up. But a telegram came from his daddy in Kemper County, saying to come home immediately, he had to report to the draft board the following morning. He rode the bus all night and his daddy met him at the bus station and took him to report to the Army. He spent one Christmas at Bastogne in the Battle of the Bulge and the following Christmas at Garmish-Partenkirchen serving as a lifeguard in the beautiful mountains during occupation before coming back home, going to trade school, and putting a life together. At the opening of the next decade, the first little girl was born. Four years later, the second came along. Christmases during the 1950s were fun for him. He was living the American dream. In the snapshot, a white circle of flash from the Kodak sits on the dark screen of the tabletop Philco TV, two big round knobs for On/Off and Volume under its face. A vase shaped like a giraffe sits on top of the television and next to it on the same wall is a blond cedar chest that holds the sparse three-foot Christmas tree, full of strung lights that are red and blue and yellow and green. The tree is doubled because it is sitting in front of a big mirror with palm fronds and flamingos on it. There’s a white sheet wrapped around the base of the tree — pretend snow — covered with packages wrapped in two or three holiday designs of paper. The baby girl stands barefooted on the polished hardwood floor, looking down at all the toys. In her right arm she is holding a cloth doll in a bonnet, half as big as she is. Her white nightgown hangs to her ankles and her brown curls are tight to her head, the white lines of her scalp showing, where sleep has parted her hair. Her white blanket lies in a heap on the floor, the stiff edge she holds in a tight fist, sticking up. To her left, the big sister sits Indian style, her flannel print gown wrapped tightly around her bare legs, cold against the floor. A doll with a bonnet and white shoes lies upside down on her lap, and she is looking at a big blackboard, about three feet long, propped up against the Philco. Her mama has written MERRY CHRISTMAS on it, and she knows she will erase that and fill it with letters and words and pictures. Baby dolls — maybe a half dozen of them — sit up against the blackboard and the cedar chest, looking back at the family. The girl’s blond hair is curled only on the ends where her mama had rolled it to make it that way. Her hair is not naturally curly like the baby sister’s. The baby sister has gotten a little wooden workbench with pegs in holes and a little hammer to pound them in farther. She has also gotten a train, the one toy the daddy takes over. The girls are slow to pick up the toys because the daddy makes such a racket laughing and saying HO! HO! HO! and LOOK AT ALL THESE TOYS!, then pretend-fussing about Santa sneaking in the front door unannounced. Rolling the train across the wood grain of the floor, the daddy surely remembers the firecrackers and oranges of his boyhood Christmases on the farm. Or maybe he remembers coming home from the war when he was put in charge of all the Mississippi soldiers on the train ride home from New York after arriving in the States by ship. The daddy always overdoes it in the mornings — laughing and singing (“I’ll get a line and you get a pole, and we’ll go down to the crawdad hole…”) and teasing — whether he is frying bacon and eggs on a workday morning or rolling a train on Christmas morning.